On Monday this week, Tokyo was hit by one of the biggest snow dumps it has seen in years. Although winters are often unfathomably cold in Japan and it’s not uncommon for snow to fall even in the capital, the city of cuddle cafes, cornman and cross-dressing was entirely unprepared for so much of the stuff in such a short space of time, and within 24 hours of the snow’s arrival the ordinarily robust public transport system was on its knees and dozens of people were left nursing twisted ankles, bruised buttocks and hurt pride. Just two days later, though, the generous blanket of white fluffy stuff had started to disappear, putting an end to all sledging, snowman building and frosty fun. As quickly as it had arrived, Tokyo’s winter wonderland was already nearly gone. From the topmost floor of Rocket Towers, international man of mystery and reporter extraordinaire Mr. Sato watched as men with shovels worked to clear the last of the snow from the pavements and miniature mountains began to appear on each street corner, adorning the footways like dollops of sweet white frosting around the edge of a miserable grey cake. It was at that moment that a quite remarkable idea hit him. Zipping up his wind breaker and grabbing his wallet, Mr. Sato charged out of the office like a man possessed and flew down the stairs. Bursting out of the building, he headed directly for the nearest supermarket. Moments later, he stepped back out onto the city streets armed with three bottles of thick, sugary syrup. Things were about to get tasty. With strawberry, melon and worryingly yellow lemon flavours of syrup in hand, Mr. Sato trawled the streets of Shinjuku looking for the most delicious-looking piles of snow that he could find. 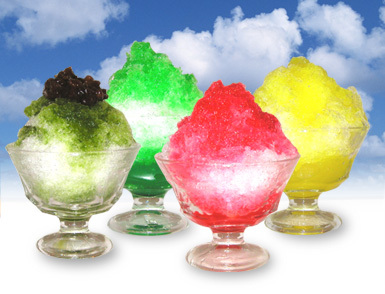 Although to most the snow was little more than dangerous mounds of frozen water waiting to be slipped on, Mr. Sato saw it as the perfect opportunity to enjoy as much free kakigōri (shaved ice with sweet toppings) as he could eat. After all, despite being mostly water, the stuff costs a small fortune during the summer at festivals! Although much of the snow had been cleared or melted away, it didn’t take long before our man spied a tempting pile sitting untouched near a pedestrian crossing. Fluffy, white and still in surprisingly good condition despite dogs peeing nearby and passing vehicles spurting out noxious gasses, the untapped frosty snack called out to him to try it. After a thorough inspection and the removal of a couple of dead leaves, Mr. Sato reached for his bottle of strawberry syrup and got to work. Success! Had it been handed to him in the middle of a festival scene he would never have guessed it had sat at the side of a street for three days! “More! There has to be more good snow left to sample!” our ravenous reporter thought to himself, screwing the syrup cap back on and looking around like a meerkat high on caffeine. Just around the corner, he came across a dejected-looking icy puddle that needed some attention. With an entirely different colour and texture to the first snack spot, this one simply had to be sampled. From that point on, Mr. Sato was on a roll. Leaving no snow bank untasted, he combed the city looking for new and interesting taste sensations. As much fun as he seems to be having, we have to wonder about all of the dirt, exhaust fumes and animal waste that have found their way into that snow, Mr. Sato. Don’t try this at home, kids; it might damage your brain and before you know it you’ll be scampering through the night wearing camo gear. Something Dark And Bittersweet Is Brewing in Japan For Valentine’s Day — Chocolate Beer!